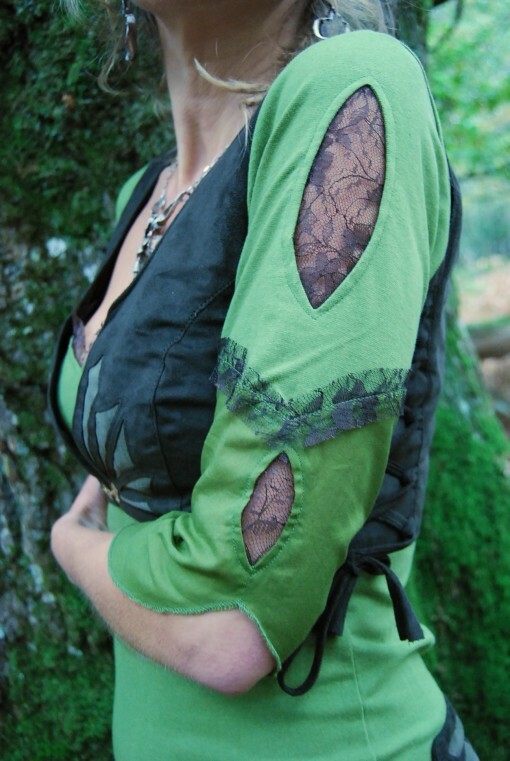 This funky little faux suede bolero style waistcoat is a must! It has a wonderful cut and the side lacing detail allows you to adjust it to fit your figure perfectly. The tailoring and finishing is fantastic and it has a beautiful cutwork design on the front radiating out from our own design of brass, ivy leaf fastening. 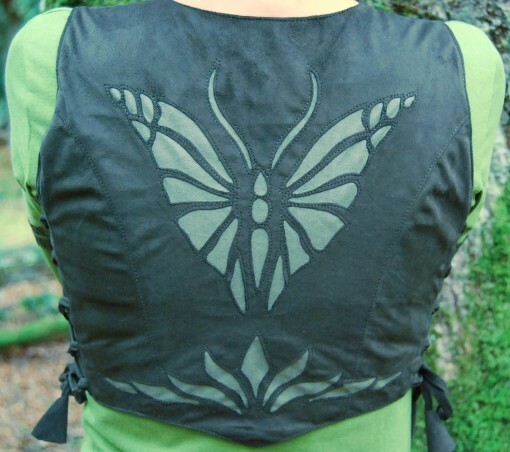 The back is stunning with its magnificent butterfly cutwork feature. I love it and it looks fabulous with all of our garments, making a great match with our cutwork mini-skirt, over a Calypso dress or an Aphrodite dress. I’m sure it will find plenty of friends in your wardrobe. 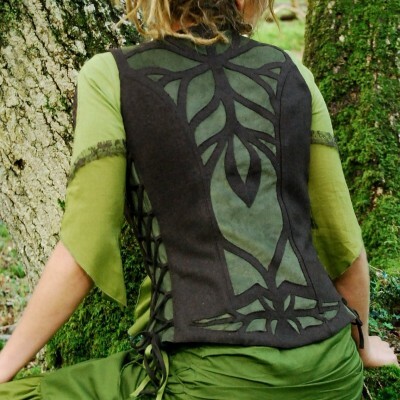 This faux suede bolero style waistcoat is a really funky fashion item with its side lacing detail adding style and practicality by allowing for adjustment within the sizes. The detail of the cutwork butterfly is stunning and combines with the effect of the faux suede to create a tribal look, especially when combined with our cutwork mini skirt. 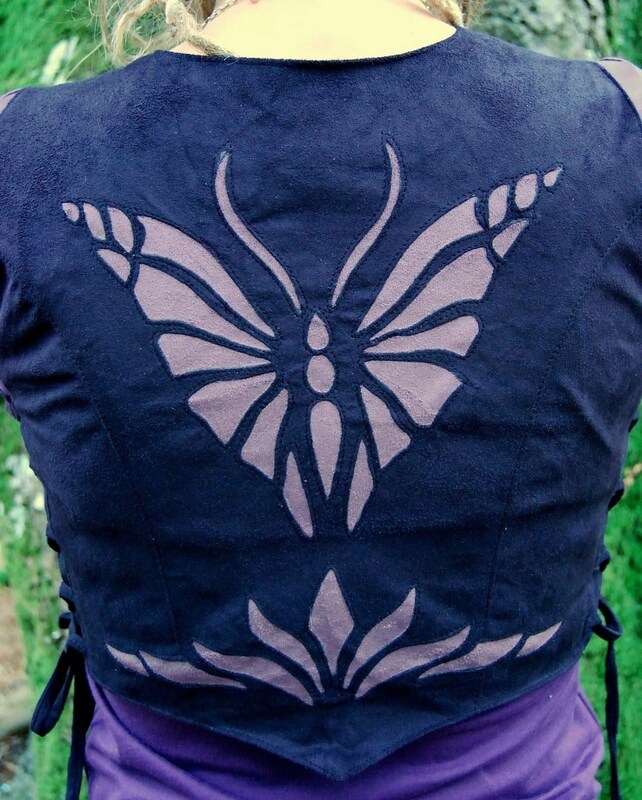 Worn with a Gaia skirt and Lyssa top the look turns more towards steam punk or fairy / faerie clothing. In our Festival clothing stall and on-line it has proved to be a well loved and versatile favourite. As part of our Goddess range it is fair trade and ethically sourced from small, family run factories.